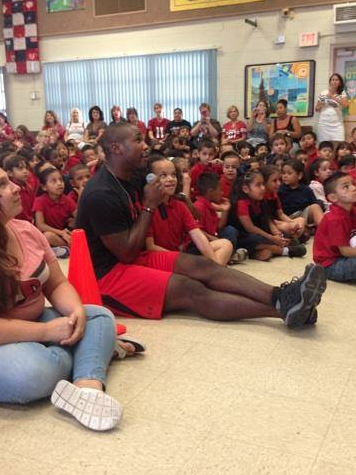 Phoenix, AZ – Arizona Cardinals’ All-Pro cornerback Patrick Peterson and the Patrick Peterson Foundation for Success held an assembly at San Marcos Elementary School on Tuesday afternoon to kick off his "Pick up a Book" program. Peterson spoke to an assembly of 100 elementary students, encouraging them to read more and challenging the entire school to read a combined 100,000 minutes by the end of the semester. Students will be responsible for recording their reading minutes online on a Scholastic website. San Marcos Elementary School will compete against over 60 other local schools. The school with the highest combined recorded minutes of reading will win a Papa John’s Pizza Party with Peterson at the end of the semester. Peterson kicked off the challenge when he sat in the middle of the assembly and read a book aloud with the student body. 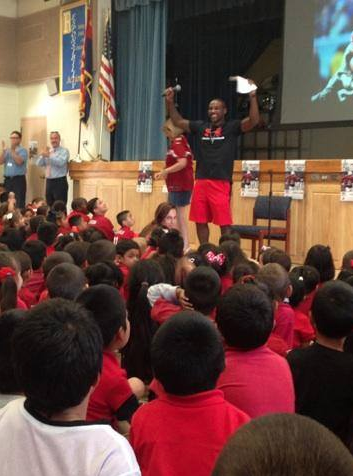 The Patrick Peterson Foundation for Success’ Pick Up a Book program is designed to bring families, schools and communities together to support children’s literacy development. The program aims to help families foster the skills, attitudes and behaviors that support children’s literacy development. For more information about the Patrick Peterson Foundation for Success or its programs, including Pick Up a Book, please visit patrickpeterson.org. Founded in 2013, the Patrick Peterson Foundation for Success is on a mission to provide low-income and inner city youth with opportunities and resources to reach their full potential with a goal to impact the lives of more than 30,000 at-risk Arizona youth by the end of 2015. For more information, please visit patrickpeterson.org. Headquartered in Louisville, Kentucky, Papa John's International, Inc. (NASDAQ: PZZA) is the world's third largest pizza delivery company. For 13 of the past 15 years, consumers have rated Papa John's No. 1 in customer satisfaction among all national pizza chains in the American Customer Satisfaction Index (ACSI). Papa John's is the Official Pizza Sponsor of the National Football League and Super Bowl XLVIII. For more information about the company or to order pizza online, visit Papa John's at www.papajohns.com. Scholastic Corporation (NASDAQ: SCHL) is the world's largest publisher and distributor of children's books and a leader in educational technology and related services and children's media. Scholastic creates quality books and ebooks, print and technology-based learning materials and programs, magazines, multi-media and other products that help children learn both at school and at home. The Company distributes its products and services worldwide through a variety of channels, including school-based book clubs and book fairs, retail stores, schools, libraries, on-air, and online atwww.scholastic.com.